Galganov's Easy Recipe for Pita! This recipe makes about 12, 6" (15 cm) pitas. approximately 1 ½ to 2 cups all purpose flour. Put 1 cup warm water into the bowl and gradually sprinkle the yeast over the water allowing each pellet of yeast to get wet (this means: don't just dump the yeast into the water). Allow the yeast/water to sit for about five minutes (for the yeast to soften) then with the wooden spoon (or better, a whisk) beat the yeast until it is fully dissolved. To the yeast mixture, add 1 teaspoon salt,(At this point you may have also added [or may now add] any herbs or other flavourings you might enjoy in your dough.) Flavouring your pita with chives can be very nice but may inhibit its ability to puff while cooking. Beat with the spoon (or whisk) until all the ingredients are blended.To the mixture add 1 cup all purpose (or whole wheat) flour. Beat with the wooden spoon (or whisk) until the mixture is smooth and cascades of the back of the spoon (approximately 90 firms strokes with a spoon) or with the whisk until everything is fully blended. With a wooden spoon stir in 3/4 cup of all purpose flour until all the flour is absorbed by the dough. Gradually add the balance of the flour - 1/4 cup at a time - first with the spoon and then by hand until the dough is no longer sticky. Turn the dough out onto a lightly floured board and knead with a "push and turn" motion until the dough begins to feel responsive under your hand - about 5 minutes. The dough should have just enough flour so that it is not sticky when kneading. Dust the dough lightly with flour during the kneading process if you find it sticking to your hands. When the dough has risen to double its volume (about 1/2 hour) turn it out onto a lightly floured board and knead briefly (or press out) to remove the bubbles. Divide the dough into 12 equal parts for pitas about 6" (15 cm) diameter (or to the size + number of pitas you want. Place the diffuser (pan) on a large burner (not the largest but not a small burner for simmering) and set the dial to 3 1/2 (a bit under medium). Flour your work surface well and coat a slightly flattened ball of dough, on both sides, in the flour. Roll out that piece to about 6 inches (1/16 to 1/8 inch thick) Dusting lightly with flour if it sticks to the rolling pin. Do the same with a second ball of dough. *Place the first piece on the pan and prepare your third piece. 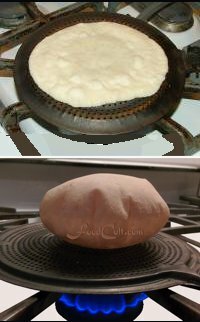 Watch the pita heating and turn it over when it starts to bubble. Continue the rolling and cooking process until all the dough is done. Too hot to turn? Use the back of a teaspoon to lift it. A fork may pierce the dough and then they're guaranteed not to puff! A "PITA" tip for gas or propane users: With this form of cooking you can raise the temperature briefly to "high" to encourage puffing. A word of "pita" encouragement: We still celebrate when they all puff. Don't feel bad if none do the first (or even the second) time. Pita is one of the fastest, easiest breads to make but getting them to puff can be tricky. You have to watch, carefully, how they behave on the pan and move them around and turn them accordingly. Practice makes perfect. It gets better and easier each time! Pita is a simple, yest-raised bread. It is also known as Arab Bread, Flat Bread or Flatbread; Israeli Flat Bread or Flatbread, Flat Bread, Flatbread, Syrian Bread, Middle Eastern Flat Bread, Armenian Bread, Pita Pockets, Pita Bread, Khubz, Pitta. There may be other names but we don't know them. You will find pita all around the Mediterranean Sea. Some people make them with milk, these are vegan. The Greek pitas seem to be a littled thicker ... and it changes from place to place We don't know, for sure, the origins of this delighful flatbread we only know that in italy, they have "pizza" instead of "pita" and we think it's no coincidence! But this page is about Pita - one of our favourite breads! The only special tool we use for this recipe is a heat diffuser pictured on this page. In India they may be purchased as "chapati pans" or "toasters". In a camping supply store, they may be bought as "campfire toasters". We have purchased cheap heat diffusers (when giving lessons) in some North American dollar stores. Anything you may call them, we've found them to be the best tool for making pitas. Fact is, there is no substitute for fresh pita. They're even nicer when they've sat, for 1/2 hour, in plastic bag after cooling. This makes them a little chewy. Since they are essentially of oil (except that used to coat the dough prior to rising) or anything else which may act a preservative, pita really doesn't keep very long but they do freeze well. Frozen pitas make excellent instant pizza crusts! 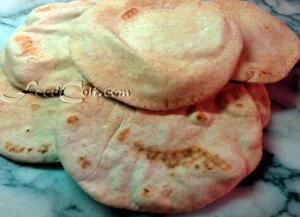 Make a light (30 %) whole wheat pita (like these) instead of white. Start with 3/4 C whole wheat flour. Finish your batch of dough with white flour.